Discussion in 'AMD Flavor' started by c3k, Aug 11, 2018. Sure, Asus Strix has an aftermarket cooling solution. Anyone else? I'm looking for a 2560x1440 gaming AMD card. Vega56 would fit the bill. I'd like something other than the reference cooler, but there seems to be a dearth of designs. They're still overpriced though IMO. Thanks. 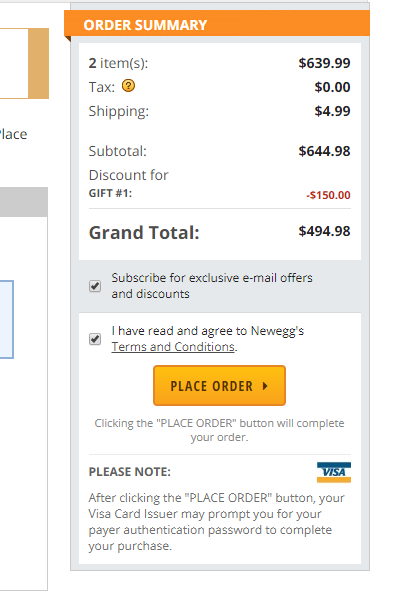 For some reason, my Newegg perusal skipped Sapphire. But, yeah, I agree with the overprice. Sigh. My goal is to replace an R9 390 with a Vega 56, and then use the 390 in a new build which won't see much gaming. Yet. It is unfortunate that there are so few aftermarket cards, and I say that as a guy with 7 Water-cooled VEGAs. The reference designed cards are built like tanks! They are excellent for WC'ing, but not so great for sir cooling. I have seen Vega 64s below $500 new. Set up a Now in stock alert and you should be good to snag one. Don't get the pulse. Its a Nano PCB which means zero overclocking and you won't be able to flash it without bricking it. have you any info on the asus models? Asus and the Sapphire full size (nitro?) cards are very good, supposedly the Gigabyte had some issues but it seems pretty beefy as well. TBH the reference PCB is quite good as well so even the powercolor cards that slap 3-fan shrouds on them work well. Just bear in mind that these cards put out a massive amount of heat, my V56 with the Raijintek air cooler on it turned my case into a furnace. After playing games for more than an hour or two literally everything in there was 90C because I had my fans set of silence. Kinda defeated the purpose of getting rid of the blower so I put it under water. My only advice is to avoid the Nano PCB cards, they were supposed to be used for a card like the Nano Fury but I guess they never bothered or couldn't get the TDP under control so now you have these huge heatsinks strapped to half size cards with a mediocre VRM that are as locked down as you can get. Araxie and Ocellaris like this. Two RX580 overclocked in crossfire might do about the same... in reality its a 250W+ TDP card. People tend to undervolt them to get them to be more manageable. I got a nice surprise. 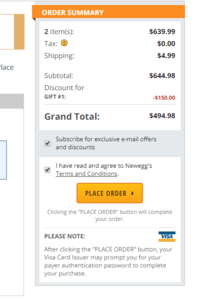 I ordered the Asus Strix through Newegg for $489 and was happily surprised to get an instant $150 AMD gift card...which was taken off my invoice. So, yeah: jump on it. 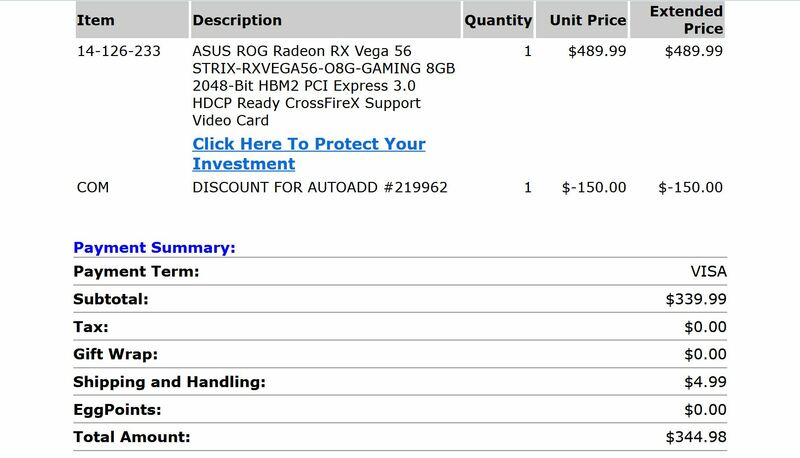 An Asus Strix Vega 56 for ~$350 out of pocket. deruberhanyok and primetime like this. did yours look like this during checkout? Yeah...and then later I got a new invoice...reflecting the 489 minus 150. That first one had me puzzled and I shrugged. The second one made me smile. I'm pretty happy, as you could imagine, to get this card for this price. I'm building a new rig (not yet in sig), based around an AMD 2700x. This card and a 2560x1440 screen will fill the build nicely. Another Vega 56 card at this price would be nice to replace an R9 390 for the same screen resolution. BUT it ALSO shows a pending fee of 150 dollars in addition to the 346.....Maybe its just a pending glitch that gets dropped? Wondering if AMD might respond to RTX with price drops. I don't see Vega competing very well with a 2070 at $500, but if those "instant rebates" are hinting at a future new norm of $350ish, it might keep them a viable option.